Bandung – Creative City or the Legacy of US Imperialism? The Empire has developed a complex system of slapping faces and humiliating all those who defy its dictate. It has also become increasingly generous when rewarding its allies and lackeys. Of course no medals are distributed. But much better goodies are offered. The Empire uses all sorts of propaganda tricks, even “employing” some international organizations, like the United Nations, to reward its best pawns. Very often then, what is obviously black is redefined and propagated as white. Something dreadful is hailed as a great indisputable achievement. And some totally collapsed, failed country or city is suddenly singled out and showered with praises and rewards. This is exactly what took place in 2015, when the United Nations Educational, Scientific and Cultural Organization (UNESCO) put the Indonesian city of Bandung on its newly created list of “World Creative Cities”. There is absolutely nothing creative about Bandung. Its 2.5 million inhabitants, like the inhabitants of all other Indonesian cities, are condemned to only three “social and cultural activities”: eating, family gatherings and praying. Not one permanent concert hall now brightens the life of this former Dutch hill station turned into some sort of “city of learning”. There are no art cinemas and not one decent museum (save one that, had it been located in the People’s Republic of China, could serve no more than a city of 50,000 inhabitants). There are a few parks in Bandung, but they are tiny, dirty and disconnected. There are several malls and commercial cinemas showing the lowest level pop Hollywood junk. The rest is, as elsewhere in Indonesia, an over-commercialized and desperate urban sprawl with no planning. Of course there are hundreds of “boutiques”, or more precisely, of makeshift, badly put together shops selling fake goods to both locals and foreigners. These fakes are so openly ‘forgeries’ that the sellers are even rating them; depending on how closely they resemble the originals. To be precise, there are 5 levels of “forgeries”. One wonders whether these mountains of counterfeit garments and apparels are what UNESCO actually considers to be an expression of “creativity”, as in Bandung there seems to be very little else. But since the 1965 massacres orchestrated by the West, during which between 2 and 3 million local Communists and intellectuals were slaughtered, Indonesia is firmly considered a friend and a trusted ally. Bandung has seen its share of massacres. Could those slaughters be considered “creative”, could they still be hailed and commemorated by the “international community”, after all those years? Am I being too cynical, or is it the UN that is cynical? Bandung has no public transportation to speak of. Imagine a city the size of Amsterdam and Brussels combined, or like Nagoya, choking on its fumes, over flooded by stinking scooters, a city without subways, without a heavy-duty train network, without trams, without underpasses. But it gets much worse: there are no large libraries, no art projects except for one or two decent galleries located on the outskirts of the city. When my Chinese-Indonesian friend (a concert pianist and a graduate of the renowned Manhattan School of Music) was forced to return from New York to Bandung by her conservative Christian family, she tried to resist the deep gloom by working and trying to enlighten her city. She bought a keyboard (no tuners were found for concert pianos) and she practiced day and night. And she played concerts, at least once a year. These concerts were of the highest world caliber. But she did not last long. Her art went totally unappreciated. The last blow came during her appearance at the French Cultural Institute, where she was attempting to play Chopin. The dirty and small hall was rat-infested, but it was the only option available with a concert piano. During the concert, the public would get up and come up to her. People were sticking their mobile phones and cameras straight into her face, with the flashes blinding her. After this, she sold everything and began losing her hair. That was it for her, life as a musician in Bandung, “a creative city”. There are several bizarre institutions in Bandung, like an extremely popular Nazi bar, called “Soldaten Kaffee”. It is full of Swastikas and portraits of Adolf Hitler. Is this really what UNESCO means by “creativity”? There is also an outdoor amphitheater, which periodically performs Angklung, a traditional form of Indonesian music, an art form based mainly on bamboo pipes, which has made it on to the list of intangible world heritage. The problem is that the place has cannibalized, literally perverted its own heritage, as the orchestra mainly performs Western pop music using traditional instruments. You can hear plenty of Delilah and I did it my way, and very little of the great original West Javanese music. UNESCO should complain and threaten, but it doesn’t. Yes, a city of 2.5 million, almost entirely stripped of creativity, is now declared a “World Creative City”. Life without great music, without theatre, daring architectural concepts, parks, public places; it is all the result of 50 years of horrendous turbo-capitalism and anti-intellectualism injected there by the West and implemented by the treasonous cadre – General Suharto – and his cohorts. This is exactly how things are supposed to function in the Empire’s colonies. Brainless television shows, pop music, crappy films, urban fragmentation, collapsed infrastructure, all sorts of religious and oppressive family structures. No variations, no escape. This is where Indonesia has ended up. So let’s celebrate the great “creativity” of the city, which has redefined boredom and tastelessness! 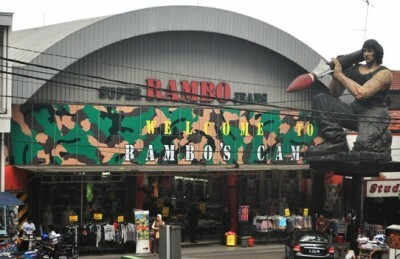 Right near the city center, there is a huge statue of Rambo holding a shoulder missile launcher. There are Hitler’s posters sold by the road. There is a poor tiny blindfolded little monkey forced to dance to a Sudanese tune, right next to the highway entrance into the city center. And there are child beggars and vendors and deformed people, all calling for our attention. I would like to see UNESCO’s criteria for this inscription. I would like to meet the person who worked on putting Bandung on the list; a person no doubt so thoroughly obsessed with promoting a fascist state and concept implanted by the Empire. “Shame on you!” I would say to him or her. There is one place in Bandung that UNESCO should be interested in, but isn’t. It is perhaps one of the most important structures in Asia, and it is called the Museum Of Asia Africa Conference in Bandung. This is where the great 1955 conference of the non-aligned movement was held, bringing together nations that were resisting imperialism. But it is not even inscribed as a world heritage site. This magnificent tropical art deco building is where the roots of Bandung and Indonesia’s collapse really lie. This is where the great Indonesian leader, President Ahmed Sukarno spoke against colonialism. And after that, the West decided: it is time to destroy the country and its government! “Bandung world creative city”, is nothing other than a stamp of approval UNESCO has given to the terror that Indonesia has been suffering by the United States, Europe and its own whoring elites. And how paradoxical and cynical this stamp really is! UNESCO stands for the United Nations Educational, Scientific and Cultural Organization. During and after the 1965 coup, education, culture and science were thoroughly destroyed in Indonesia. Today, this fourth most populous nation on earth does not have one single writer, thinker or scientist of international caliber.